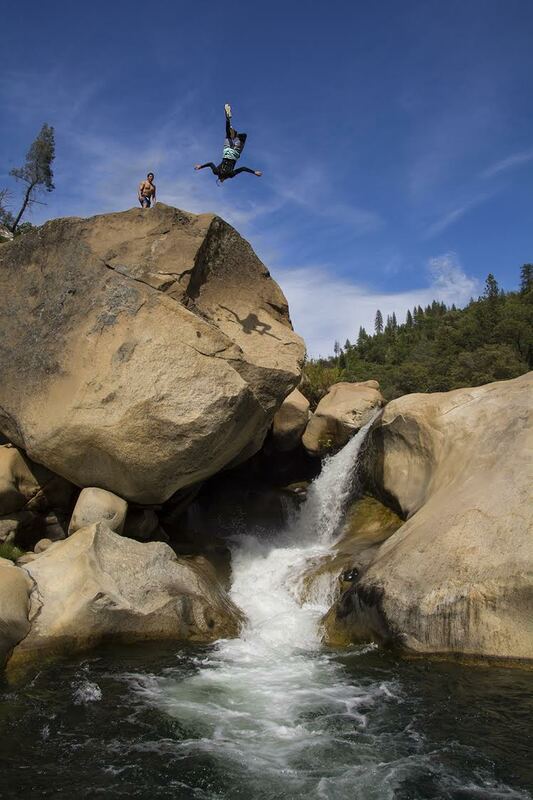 I know it’s only April, but cliff jumping season couldn’t come sooner, so 12 of my buddies and I went down to a hot local spot called “Candy Rock” located in the Stanislaus National Forest. At a scorching 70 degrees, it was a mystery why there weren’t too many people here. Actually, we were the only group of people that were there for the greater part of the day. After turning down the three miles of potholes and gravel known as Candy Rock Road, you arrive at a roundabout where you park anywhere. Then .25 miles of stairs leads you to the first swimming hole. 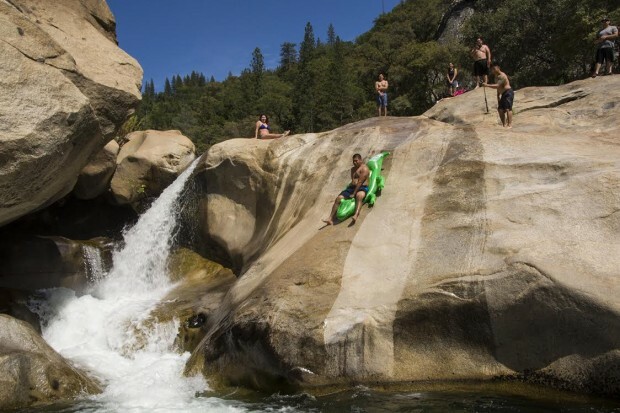 This is a beautiful place where you can test the water and warm up your jumps and flips at the 12 foot cliffs. Once you’ve gained some confidence, time to head down to the big boy. After rock crawling downstream a tenth of a mile, you arrive at a small waterfall that is adjacent to “Candy Rock.” Trust me, you won’t miss it. Once you get to the rock, you have two adventurous options. 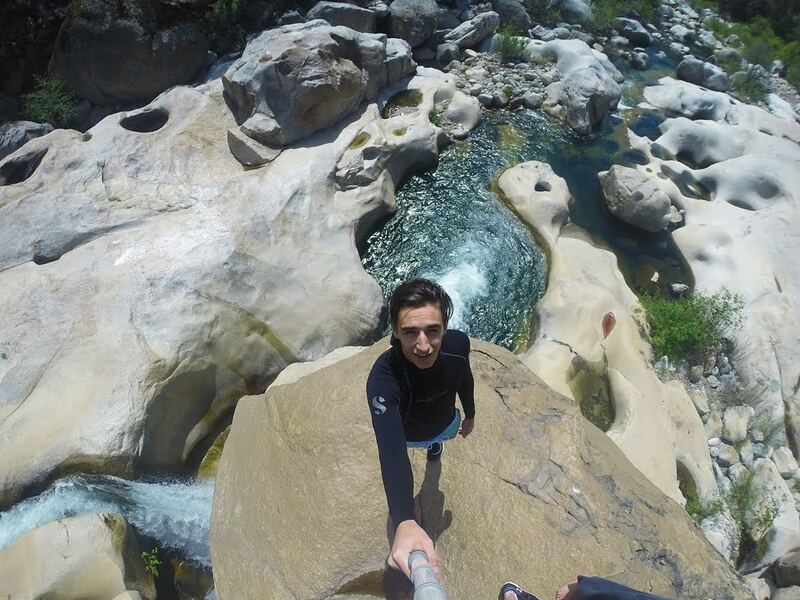 One, you can jump off the rock, 30′ into the waterfall tailings. 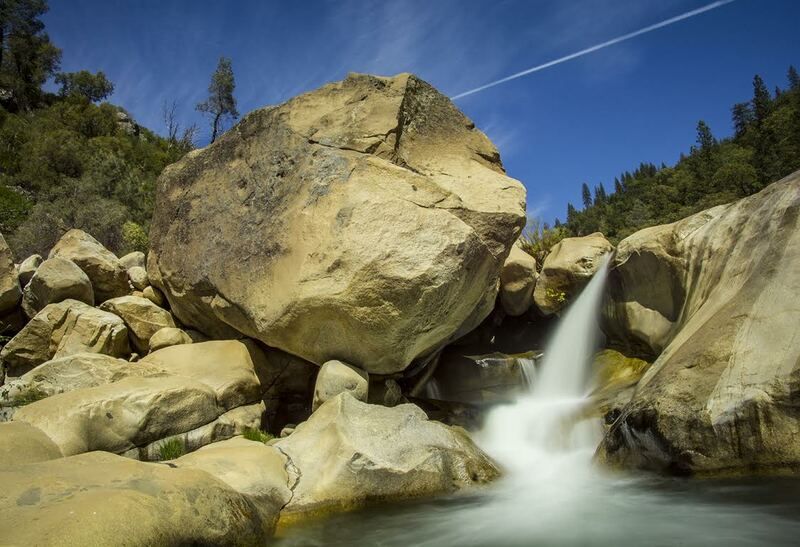 Two, you can put a little water on the face of the rock slabs and slide down 25′ into the waterfall tailings. Both options are amazing, it’s just a wonder how nature could create two glorious things directly next to each other. Bring water, the canyon can get hot and the hike back up the stairs is always brutal. Bro, how is you mentioning another spot “keeping it on the down-low” bro? DO NOT GO SWIMMING HERE AFTER THE 2016/17 winter. The river is raging far too intense for any safe swimming. Memorial Day weekend 2017 we were at this spot and had to rescue someone from another group from drowning. Has anyone been here in the last couple of weeks? Are there any road closures on the way to Candy Rock? How’s the water levels? I’ve heard other swimming holes aren’t currently safe. Your info would be greatly appreciated. We went there 3 weeks ago and the note (that the road is closed) was pushed away by some other guys. But on the way up we met a ranger who told us that the road is closed until the end of the year and they take care that nobody will go down from that day on. And I understand why, the road is totaly broken, you don’t have any services on your mobile phone and the rocks are so dangerous because they are slippery. Beauty is not worth it ….. Her life has changed dramaticly… and for ever. Oh My GOD!! So sorry, please tell us more. the road is still closed at the point where you turn up to go to the Quarry. You can park and walk in, it is roughly 1.5-2 miles each way and then you have the walk down the hill to the river. We didn’t do the trek down as it was too hot. At the Ranger Station they did say its pretty dangerous right now due to fast flow of the river, but still useable, you just need to use common sense. Hello HooKooEHoo! Thank you for your update. I want to be sure I understand what you’re saying. Are you saying as of July 2017, the first half of Candy Rock Road is open? In other words, I can drive the first half of Candy Rock Road but then it is closed at the point where the quarry on the road is located? (That’s where the un-paved, very rocky road begins.) I can then park my car when I reach the closed part of the road and walk the rest of the way until I reach the main Candy Rock swimming area. Do I have this right? Please respond, I’m hoping to drive many hours there this weekend and I want to be sure. Thank you so much. If anyone else knows, please reply and let me know. Yes, I am also interested in understanding. Can we drive our car to that area before it gets super bumpy? I’d love to hear about the road too, and about rate of flow and if folks are able to swim safely with common sense there. Thanks! From the gate at the quarry, the hike is 2.5 miles to trail head. The road is a Southern aspect and receives direct sun all day long. No cell service at the river. Temps have been ranging from 95 to 106 during the day. EMS access is limited. Fire restrictions are currently in place. No BBQs, Campfires, or smoking. Suggestions, carry at least a gallon of water or a water filter, (river and spring water are not drinkable) and high energy snacks. Expect extended response from medics. Ok everyone, so I just went to Candy Rock this past weekend (7/22/2017). Drive into Hunter Dam Road and you will reach a wooden sign that says “Candy Rock Closed. Do Not Enter.” Pay no attention to it, just keep on driving. It’s a narrow, extremely rocky road. Do not attempt to drive on this road in a normal car. You will need a large truck or SUV. The road is destroyed and the potholes are deep. You’ve been warned. After driving on it for about 10 or 15 minutes you will reach a closed gate with barriers. Other cars might be parked there as well. There were about seven other cars when I went. Park your car there then hike the rest of the road. It’s all down hill and will take you an hour. You will know you’re at the swim hole when your reach the end of the road, at a roundabout, and see lots of empty beer cans and garbage (really not cool.) Pack enough water and food for yourself to last you several hours. The hike back is the devil. You will be exhausted, that I can promise. The flow of the water is strong and it feels great in hot weather. Don’t do anything stupid and you will be fine. I went there on August 5th. The road is closed. But it is nice hiking about 1 hour there. I jumped 3 times off the Candy Rock. It was awesome. Deep and cool water for outside temperature about 90F. I also slide down about 25′ waterfall tailings. There was a group of students with camping. They enjoyed weather and danced with music. It was wonderfull weekend. Thank you, Nature. I hear Blue streak is near by, I never been here but plan on going this weekend. I plan on going to Blue streak any tips? I plan on heading out this way this weekend. I hear blue streak is near by, Any tips for getting to blue streak? When I went to Candy Rock I also tried going to Blue Streak. It’s downstream from Candy Rock. However, I have no clue how people got to Blue Streak because there is no trail leading to it. I tried swimming down but it’s impossible. I didn’t make it. Also, I doubt Blue Streak has more to offer than Candy Rock. candy rock status 2018? is the road still out? CR is currently accessible. The new road closure is at the Adit. No motorized vehicles beyond that point. The parking area is large, I counted 31 cars parked on Sat. EMS clocked distance at just shy of 2 miles one way to the old lower parking lot. Curious to what the CFS rate is. Is it slow enough to be able to do the slide that leads into the pool below the Candy rock? Many years ago there was a 6 ft deep 4′ wide hole that was all bubbles that you would go in just before pushing out to this small slide. Is it still there?